Passing the time after 10:00 PM on Monday night, the television found its way to the History Channel for the return of Pawn Stars, the reality show about a pawn shop in Las Vegas. While the first show of the hour was just interesting it was the second show that started at 10:33 PM that was more intriguing. Opening the show, a seller name Walter walked in with two rare coins. The first coin was a 1792 Half Disme and the other a silver Libertas Americana. Two coins dating back to the earliest days of the country’s history. If you recognize Walter his full name is Walter Husak. In 2008, Husak sold his extraordinary collection of large cents at an auction held during that year’s Long Beach Expo. For this show, he was selling the two coins. The 1792 Half Disme was graded MS-65 by Numismatic Guarantee Corporation who lists the coin as a TOP POP, meaning no coin has graded higher. 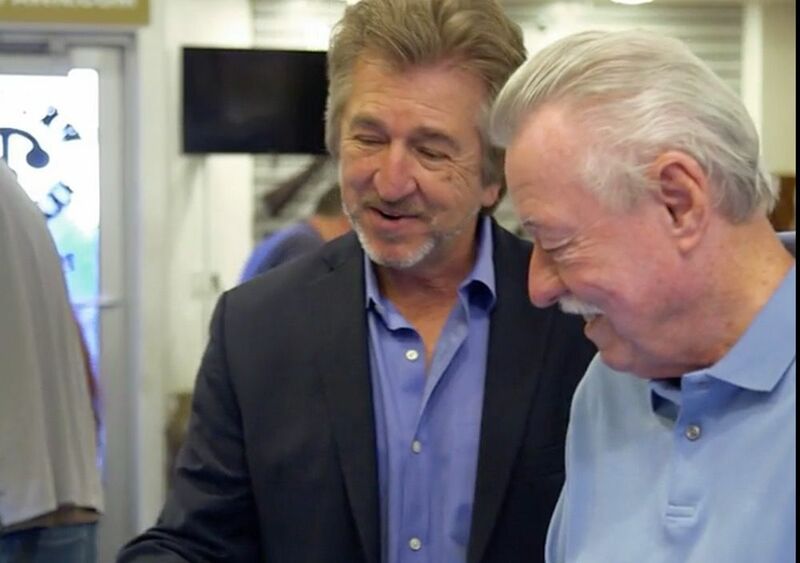 There are only two half dismes graded MS-65 by NGC and one appeared on Pawn Stars. As with a lot of these purchases, Rick calls in an expert for assistance. This time, the expert is Jeff Garrett, the founder of Mid-American Rare Coin Galleries in Lexington, Kentucky and immediate past president of the American Numismatic Association. I noted that Garrett’s firm is in Lexington since the location of the television show is in Las Vegas. While doing a little online investigation into the prices and to see if there was more information, there was a note on the Collectors Universe forums suggesting that the segment was not a reality, but it had been staged. I believe Ccardinal is the anonymous person behind the Cardinal Collection who has collected some of the finest coins in the PCGS registry. During the show, the half disme was a no-sale. The Libertas medal was shown as sold at $150K on camera. That being said, the piece was not actually sold, even though Rick actually did want to buy it for $150K. I have heard stories as to how some segments are real and some are staged. When I spoke with Charmy Harker about her appearance in 2012, I was under the impression that her attempt at selling a World War II-era aerial bomber camera was not overly staged. That does not seem to be the case in this episode. My one complaint is that these two esteemed numismatists mispronounced the name of the coin. Everyone kept pronouncing disme as “DIZ-ME.” In reality, disme is pronounced as if the “s” was not included in the word. Disme is derived from the French term for tenth but pronounced dime—which is why the “s” was dropped after the first issues of 1792 coins. Oh well… it was a fun segment to watch. Time for some mindless levity. While looking for numismatic-related stories around the interwebs, I came across this video. With 200 coins that appears to be the size of a quarter, the presenter builds a bridge of coins that loops off the edge of the table. It’s Tuesday and there is a long week ahead! Did you know that someone made a movie about the $2 bill? I was looking for information about early $2 notes and an Internet search discovered the page for The Two Dollar Bill Documentary. Basically, it is a 1 hour 43 minute documentary about the $2 bill. Written and directed by John Bennardo, who has one other film to his credits, writes on the website that he wanted to learn more about the stack of $2 bills he kept in his desk draw. A year and several interviews later, Bennardo had a documentary. Amongst the people who appear in the documentary is Charlene Williams, Director of Manufacturing at the Bureau of Engraving and Printing facility in Fort Worth, Fred Bart, owner of Executive Currency, and Ben Cohen who is the “Ben” in Ben & Jerry’s. I do not know how I missed this because it was the Kickstarter campaign written about in CoinWeek, and I am a regular reader. Also, filming began at the 2013 FUN Convention, a show I attended. It does not appear that the documentary had a wide distribution since I did not find anything about its showing. But for the low sales price of $9.99 you can by a DVD through their online store. It might be worth spending the $10 just to check out the documentary. Amateur photos of stolen coins — like this, taken from a cache of images held by a middleman — are sent from phone to phone in the underground trade. If counterfeit Canadian currency or badly made British pound errors were not enough, the focus is now being placed on antiquities stolen by ISIS from captured areas in Syria and Iraq. The proceeds have been used to fund their activities. A Wall Street Journal report said that Swiss authorities have been investigating Ali and Hicham Aboutaam, owners of the Phoenix Ancient Art Company with offices in New York and Geneva. It is alleged that items that they have been trading in artifacts looted by ISIS. That may have been a ruse by only showing a few items destroyed since it is estimated that ISIS generates $100-250 million per year selling looted antiquities on the black market. While art and statues are easy to trace, coins are a different story. Coins can be carried easily in pockets, wrapped in clothes, or just “innocently” thrown into luggage and smuggled anywhere in the world. Detection is difficult and without documentation, they may be difficult to trace. Reports in the international media note that weak laws and the lure of significant profits have kept the sales of artifacts and looted coins moving through the system. Looted coins have been sold on sites like eBay and Etsy without fear of reprisals because their provenance cannot be proven. Even though the 1970 UNESCO Convention was agreed upon to stop archaeological pillaging and trafficking of cultural property, the way it is implemented in most countries is to recover the item at its final destination and not in transit. An unsuspecting collector or dealer could be in the position of one of these looted coins but have to face the consequences if they are caught. The sale of these coins supports ISIS and their terrorist activities. Even after the coins have changed hands several times, they could circulate through the industry and be used by dealers down the like who will continue to trade the coins and using the profits to help fund ISIS. It would be easy to say to resist buying ancient Syrian or Persian coins, but there are coins that were not stolen and can be legitimately owned. This might be an area that the Ancient Coin Collectors Guild should weigh in on behalf their community. Until then, try to limit your purchases to reputable dealers and dealers you know. Image courtesy of BuzzFeed News. As I am working on a manuscript about counterfeiting coins and currency, I started to search the internet for the location of some information when I stumbled on The British Museum’s website. Rather than find something about counterfeiting, searching the term “defacing coins” lead me to the most recent Curator’s Corner blog entry by Thomas Hockenhull, the curator of Modern Money for The British Museum. I have not to been to London for many years, but I remember spending a day at The British Museum was a highlight of the trip. It is one of the great museums of the world and worth setting at least one day touring the museum. There is so much to see that if you love to see the living embodiment of history, consider spending more than a day. 12–sided — its distinctive shape makes it instantly recognisable, even by touch. Bimetallic — it is made of two metals. The outer ring is gold coloured (nickel-brass) and the inner ring is silver coloured (nickel-plated alloy). Latent image — it has an image like a hologram that changes from a £ symbol to the number ‘1’ when the coin is seen from different angles. Micro-lettering — it has very small lettering on the lower inside rim on both sides of the coin. One pound on the obverse heads side and the year of production on the reverse “tails” side, for example 2016 or 2017. Milled edges — it has grooves on alternate sides. Hidden High Security Feature — with a patented High Security Feature to protect it from counterfeiting into the future. Design and production of the new pound coin have been nearly three years in the making following the discovery of a large number of counterfeit £1 coins. Sources estimated that about 3-percent of the £1 coins in circulation are fake amounting to more than 45 million counterfeit coins. These fakes are so convincing and very well constructed that they can be successfully used in vending machines for payment including in London’s Underground. The coin-operated businesses in Britain began complaining three years about the changes with reports that only a small fraction of all vending machines will be able to accept the new coin. Each coin-operated machine will have to be reprogramed and recalibrated to detect a coin that will have a different weight, specific gravity, and the electromagnetic signature. Amongst those systems not ready include the London Underground and several major supermarkets. While watching the news, I found that British supermarkets charge for people to use their trollies, which are called shopping carts on this side of the pond. I do not know if it is a deposit similar to the carts available at the airports, but could you imagine having to pay to use a shopping cart at your local supermarket? I do not think that would go over well in the United States! Back in October 2016, the Royal Mint published education material and test coins that the coin-operating machine companies could use to test their equipment. Some of these test coins have appeared for sale on websites like eBay. Since then, there have been weekly stories about the new coin and stories have appeared daily in the British media. Now that the new £1 coin has been released, it will co-circulate with the round pound through October 15, 2017. Banks will only distribute the new £1 coins while stores and other businesses will be allowed to accept either. During that time, it is expected for coin-operated equipment to be converted as soon as possible. On October 16, 2017, the round pound will be demonetized and lose all legal tender status. Once the round pound loses legal tender status, they may be exchanged at some banks and the Post Office. The plan is to end the exchange of the round pound by March 27, 2018. For collectors, this is an opportunity to collect something that was once a real circulating coin. The current round pound came into existence in 1971 when the UK transition from the pounds, shillings, and pence (£sd) system based on the power of 12 to a decimal system, called decimalization. Of course, when this happened in 1971 the web did not exist and real paper newspapers were the primary means of spreading the information about the new currency. Based on reports, there were some issues during the one-year transition but there were no stories of tragedies once the new money was issued. Somewhat like the end of the Canadian cent, this is the end for a significant circulating coin. Except the Canadians did not replace the cent while the British are exchanging coins. Before you write to me to explain about the Trade Dollar, I know it was demonetized in 1876. However, it gained legal tender status again as part of the Coinage Act of 1965. For those concerned over proposals that the United States change composition of various coins, including the one-cent coin that costs 1.5-cents to produce, watching how the UK handles the change will provide an insight as to how it might be handled here. Except for one problem: The United States does not demonetize coins (see the note in the box to the right). Every coin produced by the U.S. Mint can be used as legal tender at their face value, although it would be foolish to spend a Saint-Gaudens Double Eagle for its $20 face value since its gold content would be worth more! It will be interesting to see how stiff those proverbial stiff upper lips hold up during this transition. All images, videos, and British-style English text courtesy of the Royal Mint. I am a firm believer that in order to understand how things evolved to the way they are today, we have to study the past. History teaches us lessons that we should learn from in order to not make the same mistakes and understand how to continue the evolution. This is why when I find old video showing how things were previously done, I watch it several times to see what I can learn about the past. Take the video below, for example. It is titled “How money is Made” and appears to have been made for the Royal Canadian Mint by a company called Mogull Brothers Film Library in New York. A quick bit of Internet research shows the company was founded and run by Charles Mogull (1898-1986) in Brooklyn, New York. Mogull Brothers were one of the early content creation pioneers. They would shoot a film on various subjects, edit them into smaller features, and sell the features to companies that would use them in larger compilations. Their content would be everything from features like the one they created for the Royal Canadian Mint, news events, interviews, show promotions, etc. and footage they would buy from photographers. The little information I could find on Mogull suggests that the company ceased operation in the late 1950s. 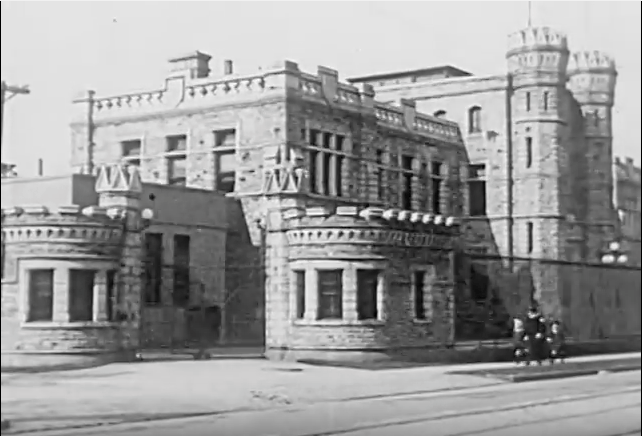 As for the film, the architecture of the original Royal Canadian Mint in Ottawa looks like a castle. I believe I read somewhere that the Royal Canadian Mint still uses the building as storage. To see this marvelous looking structure and to visit the Mint appears to be a good excuse to visit the Canadian capital. It is a silent film that the person who posted it to YouTube added music. Even with the music, you can see how film technology has changed. Rather than being able to overlay the wording over the image, a process called keying, printed cards are used to describe the content and spliced into the film. At the moment the film shows the making of the dies, they show the dies of a 1920 Canadian one cent coin with the image of George V. It was under George V, shortly after his ascension to the throne, that the Parliament Act 1911 transferred a lot of governing power to the House of Commons and started the erosion of monarch’s power. Although we are well into the industrial revolution, the mix of automation and human interaction is fascinating. For example, starting around the 8-minute mark, there is a man bouncing the coins listening for its distinctive ring that silver coins make when bounced on a hard surface. Nowadays, machines with sensors and computers check the coins for quality. Even circulating coins are rarely touched by human hands. Finally, as a little comic relief, when the film shows the title cards, look in the lower right corner at the graphics they chose to use. The filmmaker tried to use the graphics to emphasize something about what you will see next. When thinking about what to lay in the kitchen Amy came up with a fantastic idea inspired by what she had researched online. We saw a bunch of penny floor projects in the USA, it seemed a really popular way of creating a bespoke retro floor for any part of the house, but wasnt done in the UK. Challenge accepted! We took 27,000 1p coins and decided to give our kitchen diner a new look. Each coin was individually glued to the floor which had been self levelled before hand and left to dry. After gluing down all the coins a black grout was applied to fill the gaps followed by a high gloss epoxy resin to cover and seal. The end result is simply awesome. The floor looks stunning and the weeks of hard work has been worth the pain. Seems like an inexpensive idea. Take £270 in pennys (yes, that is how the Brits spell the plural of penny), glue, grout, apply a high gloss epoxy resin, and take about two weeks of work to come up with something different. For anyone curious, £270 is currently equivalent to $337.88. Maybe his video will inspire your creativity! 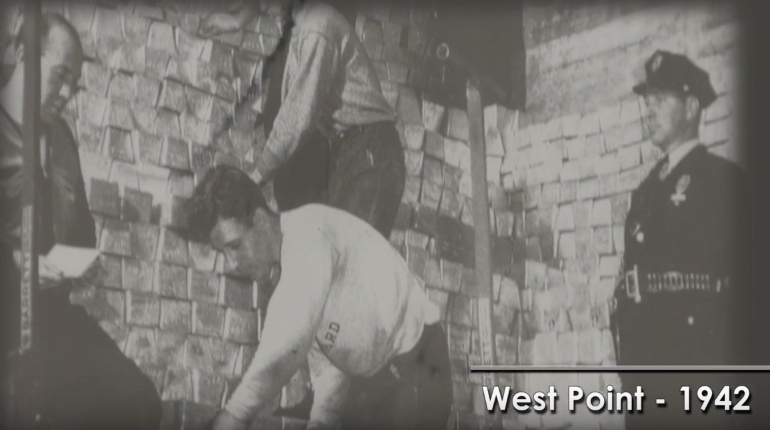 While we cannot tour or see inside the Bullion Repository at Fort Knox, Kentucky, the U.S. Mint just released a B-Roll video of scenes inside the gold repository at the West Point Mint. Gold stored at West Point is called “working stock.” This is the gold that the U.S. Mint uses for striking coins. Depending on the demand, the gold you will see in the video will not be there in a year. It will be used for American Gold Eagles, gold commemoratives, and gold medals cast for congress and the president. West Point has been called “The Fort Knox of Silver” because it is where the U.S. silver reserve is located. It is also the location for the working stock of silver used by the U.S. Mint. All of the U.S. Mint facilities have working stock of silver used to strike silver coinage. However, since most gold production is struck out of West Point and Philadelphia, most of the working stock of gold is in those facilities. West Point is the primary manufacturer of gold bullion coins. In the video at the 50-second mark, someone is weighing a bar of gold. He says the manufacturer claim is that it weighs 400.100 (troy ounces) but actually weighs 400.096. A gold bar weighing 400.096 troy ounces is 12.444 kilograms or 27.435 pounds. With the price of gold currently $1,176.60 per troy ounce (as this is being written), the melt value of that gold bar, which is .9999 fine looking at the stamp on the bar, is $470,752.95. Video courtesy of the U.S. Mint. Finding coins in pocket change can be a lot of fun. Then there are those who find hoards of coins buried in the ground or just stored somewhere that people forgot. From shipwrecks to treasure hunts, we all dream of finding the next jackpot somewhere. On your great grandfather’s farm, a worker was plowing the field and found a silver medal. It has the image of President James Madison on one side and what looks like a peace medal on the other. Rather than letting go, great grandpa traded three hogs for the medal. The medal gets handed down from generation to generation until one of his ancestors takes the medal to Antiques Roadshow to find out what it is worth. You are told that it is a silver James Madison Indian Peace Medal. The 1809 medal was designed by assistant engraver John Reich and struck at the U.S. Mint in Philadelphia. It is not the largest of the medals but at 2½-inches, it is a fairly significant medal.